The first quarter to be struck by the United States Mint was produced in 1796. Authorized by the Mint Act of 1792, it was part of the new monetary system of the United States, and was the final silver denomination (together with the dime) to be struck for production by the United States Mint. Silver and half dollars had first been struck for circulation in 1794, while half dimes were first struck during the previous year. With the dime and the quarter now being struck, 1796 marked the first year that all coins authorized by that Mint act were in circulation. After production in 1796 the quarter dollar denomination was not produced until eight years later, in 1804. As the designs of the silver coins had been considerably changed at the time a new reverse design was introduced for the quarter at that time as well, making the 1796 quarter a one year type coin which now is highly valued by collectors of United States coins. The quarter dollar is a somewhat odd denomination, whose origin can be traced back to Spanish colonial coinage, which was usually divided into 8 bits of 12 ½ cent each. A quarter was, in the early day, often nicknamed two bits, and thus composed of 25 cents. Even within the American monetary system the quarter is somewhat odd. A more logical order can be found of currency, where $20 is followed by $50, not by $25. While a twenty cent piece was tried in the United States in the 1870s it quickly failed, as the public was more used to the quarter dollar, which continues to be struck and used in the United States on an extremely large scale. The first quarter dollar was designed by Robert Scot, whose draped bust design was used on virtually all denominations, up until the early 19th century. A Philadelphia woman, named William Bingham, is said to have been the woman who sat for the portrait used on these coins. In 1804, when the second quarter dollar issue was struck, the reverse used a heraldic eagle, but in 1796 a small eagle reverse was used. This design was only produced for a few short years on the silver denominations making the 1796 quarter dollar the only possible year that this reverse could be used on this somewhat odd denomination. The mintage of the 1796 quarter was extremely small at a mere 6,146 pieces. This mintage is spread out unevenly over two different die varieties, using a common reverse paired with a different obverse. The easiest way to identify the two different varieties is by noting the position of the 6 in the date in relation to the other numerals. B-1 (after Browning, who wrote the definitive reference on the early quarter dollar series) is the scarcer variety of the two. It is the variety with the lower 6 in the date. Although in previous time it was considered rarer than it currently is, it still is offered less frequently than B-2, which has the six in the date higher in relationship to the other numerals. 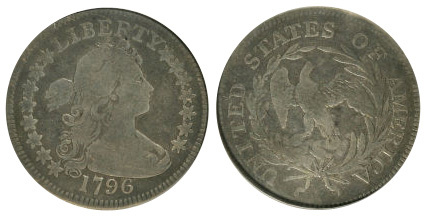 Because of the overall rarity of the 1796 quarter dollar prices for the two varieties are relatively similar, also because the total number of collectors who collect Browning varieties is relatively small, especially when compared to the number of collectors assembling such sets in the half dollar series. As previously mentioned no quarter dollars were struck after this issue for the next eight years. The main reason was that private depositors did not request this denomination. For them, it was cheaper, and more convenient to have their silver minted in silver dollars or half dollars. As for the use in general commerce, 25 cents was a large denomination in a time when average daily wages were not much more than that. As a result, this denomination was more or less forgotten, as preference was given to smaller half dimes and dimes for general commerce and half dollars and silver dollars for private depositors of silver. Another factor that needs to be taken into account to explain the lack of coinage of this issue is the fact that the majority of silver coins that were in circulation at the time were of foreign origin. In fact, this would not be outlawed until 1857, and was a major problem in the United States of the first part of the 19th century. Many of these coins were underweight and had seen much prior circulation. This would eventually play a role in the banking crisis of the 1830s, which as a major effect on the American economy of the times. Despite having such a small mintage the 1796 quarter dollar is relatively “common” in uncirculated condition. It appears that a relatively large number of coins were saved from circulation at the time of minting, resulting in relatively regular offerings at coin auctions in the 21st century. Yet, this does not mean that every coin is especially appealing, and a keen eye is always required when purchasing a 1796 quarter dollar in any condition. Because of the high demand for this issue from both early quarter collectors as well as type set collectors prices are high, and most offerings sell quickly. It is likely that a majority of the 1796 quarter dollars that are being offered at auction come from the holdings of Col. E. H. R. Green. It is said (from a comment made by Abe Kosoff in the 1940s, when most of the coins were dispersed) that approximately half of the 200 (or 100, depending on which source you consult) uncirculated 1796 quarter dollar that were in his possession came with prooflike surfaces. Because many of the uncirculated specimens that now come to the market do have prooflike surfaces it is very likely that this comment was correct. 200 uncirculated specimens would account for approximately 35% of the known examples of this issue, which seems like an extremely high number. Population reports, however, do suggest that uncirculated 1796 quarter dollars are somewhat plentiful (relatively speaking, of course). The absolute finest known 1796 quarter dollar has been certified by PCGS as MS-67 and has a pedigree that dates back to the 19th century. While this coin has not sold at public auction recently, various experts have determined its approximate value at approximately 1.2 million dollars. NGC, as their finest known, has graded two MS-66 examples. In slightly lower grades, but still in uncirculated condition, both grading services have graded several dozen. Regardless of the grade all 1796 quarter dollars are high prized items. Any uncirculated specimen usually sells for 6 figure sums at auction, while choice AU coins often sell for $50,000 or more. Depending on eye appeal, circulated specimens in VF-XF condition (which are extremely scarce), have an approximate value of $30-40,000. For lower grade coins the general accepted market price is at least $15,000, while problem coins in very low condition with lacking eye-appeal still sell for $8,000. Prices for this issue have risen tremendously over the last decade or so and any 1796 quarter dollar in problem free condition remains an excellent investment possibility.